Syed Asif Nizami and his nephew Nazim Nizami were offloaded from Karachi-bound Shaheen Airlines on March 14 at the Allama Iqbal International Airport. 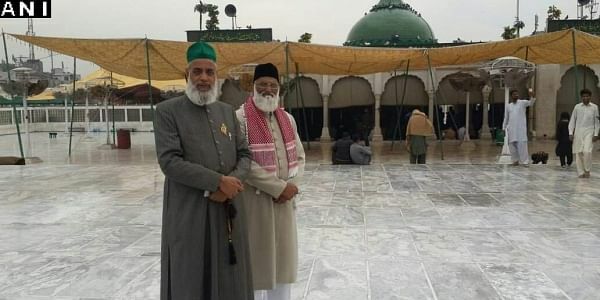 LAHORE: The two missing Indian clerics of Delhi's Hazrat Nizamuddin Dargah are in custody of Pakistan's intelligence agency over their alleged links with the Muttahida Qaumi Movement (MQM), official sources said today. Syed Asif Nizami and his nephew Nazim Nizami were offloaded from Karachi-bound Shaheen Airlines on March 14 at the Allama Iqbal International Airport, Lahore, they said. "The personnel of an intelligence took both the clerics into custody after getting them offloaded and shifted them to an undisclosed location for investigation," the sources told PTI on condition of anonymity. They further said both clerics have been detained for their alleged link with MQM of Altaf Hussain. "They are being interrogated for their alleged links with Altaf's partymen in Karachi," the sources said, adding they will be freed if nothing is established against them. The MQM emerged as a largely ethnic party in the 1980s. It has political dominance in the southern Sindh province's urban areas - notably in Karachi, Hyderabad, Mirpurkhas and Sukkur where a large number of Urdu-speaking people who fled to Pakistan from India during 1947's partition reside. 80-year-old Asif Nizami is the head priest of Hazrat Nizamuddin Aulia Dargah. He along with his nephew Nazim Ali Nizami had gone to Pakistan on March 8 to see his sister in Karachi. They arrived in Lahore on March 13 and visited shrine of sufi saint Baba Farid Gang in Pakpattan. The two went missing on March 14 from Lahore. Foreign Office spokesperson Nafees Zakaria yesterday said Pakistan was "pro-actively pursuing" and have asked all departments concerned to look into the matter. He had told PTI in Islamabad that, "no clue to the missing Indian priests has been found so far". India has taken up this matter with Pakistan and ensure the safe recovery of Indian nationals. Official sources in New Delhi said Pakistan has conveyed that it was "seriously pursuing" the case with its law enforcement agencies. "We have taken up this matter with Government of Pakistan and requested them for an update on both the Indian nationals in Pakistan. Both are missing after they landed in Karachi airport," External Affairs Minister Sushma Swaraj had tweeted. "We have also contacted their host in Karachi who appears to be under pressure not to speak to the Indian High Commission. I am in constant touch with our High Commission. However, there is no official confirmation regarding their whereabouts," she said. Pakistan has launched a crackdown on the MQM after party leader Hussain made anti-Pakistan comments during speeches at a hunger strike camp in Karachi last year. Pakistan has charged the self-exiled leader in London with treason for his inflammatory speech that incited party workers to attack media outlets.